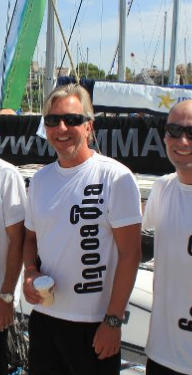 Charleston-based telecom exec Patrick Eudy stormed onto the southern sailing scene back in 2006, diving into the sport with the Big Booty program. He learnt the ropes on big boats – a J/105 and an orphaned Lutra GP42 – but quickly got hooked on one-design, and was a top-tier Melges 20 owner right through April’s Charleston Race Week. Yesterday, during a routine recertification flight with instructor Robert Ulrich, Eudy’s Rockwell Turbo Commander crashed into the lowcountry swamp near Mclellanville , killing both Pat and Ulrich. A 911 caller near the crash site noted that the motor sounded like it was acting up immediately before the dive and crash. Pat was an extremely generous and larger-than-life kind of guy, always good for for another drink or another great conversation. 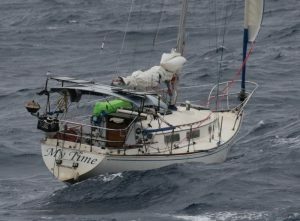 He created major opportunities for dozens of sailors, tried just about every sailing discipline he could, and was the very rare kind of owner who comes into the sport with new ideas and a fresh attitude. The community and sport are just a little poorer today for his loss, and we offer our condolences to Pat’s children, his family, his friends, and his team.